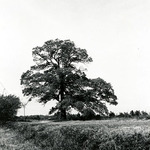 One photograph depicts, the “Klan Oak” located 2 miles south of Fort Mill, Route #36. Tradition says the Ku Klux Klan in the Eastern part of York County in late 1800s gathered here. The other photograph is of the school established on Saluda Street by Willie Chisholm for purpose of training African-American females as maids. These York County Photographs were transferred from the Vertical File of the Library’s Reference Department. Louise Pettus Archives and Special Collections, Winthrop University, "York County Photographs - Accession 38 - M13 (23)". Finding Aid 27. Search collections relating to York County, S.C.